When hard times come what do you really–truly–choose to depend upon? Karlton shares. “Abram believed the Lord, and he credited it to Him as righteousness” (Genesis 15:6). 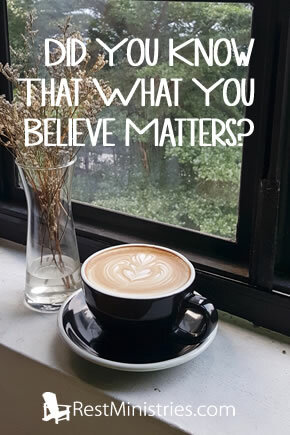 What you think, what you believe–it matters. When the world comes crashing down on you, and everything possible goes wrong, the core of your beliefs will rise to the surface. What you think about life, about death, about yourself and others will shape your actions and reactions throughout your life. If you have a life built upon the foundation of Jesus then no matter what comes your way, nothing can ultimately defeat you, not even death. For those who do not believe in Jesus, there is no promise to cling to. There is no hope to look forward to when life gives you its worst. Who will pick you up when life knocks you down? What can carry you if you have no core foundation of belief that there is more to life than suffering and death? I have been through the dark night of the soul, with the barking dog of depression at my heels. The enemy of my soul shouting into my mind that there was no hope, only death awaiting me, endless darkness my lot. Yet God sent His word and delivered me from darkness. Who would I believe? God or satan? When my enemy threw his worst at me, he did not succeed because I was clinging to God’s best. Hope in Jesus can turn the darkest night into day, it can change circumstances from despair to delight. There is no hope for anyone other than Jesus. There are not many paths, but there is one road: Jesus. What you believe can be a matter of life or death. And Who you believe in can give you hope even when at the door of death. For those who believe, we have a Savior who overcame death, and can provide for our needs throughout our lives. Prayer: Dear Lord, our hope and faith is in You. Help us to keep that faith through the good times and bad. Karlton Douglas lives in Ohio with his lovely wife. He has believed in Jesus from a young age, and Jesus has been his hope and deliverer more times than he can count. What holds you together through tough times? Have you asked Jesus to become the anchor for your soul, the hope of your life? « What Happens When We Really Devote Ourselves to Prayer?